Key Difference: An LCD uses liquid crystals that are sandwiched between two sheets of polarizing material. DLP technology uses a digital micromirror device which comprises around 2 million hinge-mounted microscopic mirrors. DLP’s are thicker compared to LCDs and cannot be hung up on a wall due to their width. DLP’s consume less power compared to LCDs and have a higher refresh rate as well. LCD (Liquid Crystal Display) and DLP (Digital Light Processing) are type of projection techniques that are used in projectors and televisions. Both these technologies have significant differences and are made of different technologies. An LCD uses liquid crystals that are sandwiched between two sheets of polarizing material. The images are displayed when electrical charge is applied to the crystals. An LCD uses a select type of liquid crystal known as twisted nematics (TN), which are twisted in shape. Applying a current to these crystals causes them to unwind to a certain degree depending on the voltage. A LCD is in a layer formation, it starts with a mirror on the back for reflection, followed by a piece of glass that has a polarizing film on the bottom side, and a common electrode plane made of indium-tin oxide on top. After that is a layer of liquid crystals, followed by another piece of glass with an electrode and another polarizing film, which is at a right angle to the first one. The LCD is then hooked up to power source that provides a charge to the crystals and causes them to create an image on the screen. LCDs also have a backlight that makes the image visible to the user. 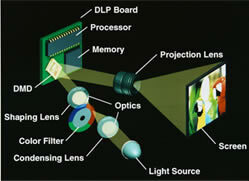 DLP technology was originally developed by Texas Instruments in 1987 and uses a digital micromirror device. This technology is most commonly used in digital cinema projection, and can also been see in TVs. 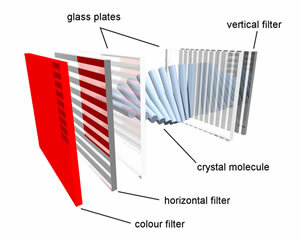 The DLP chip comprises around 2 million hinge-mounted microscopic mirrors and is combined with a digital video or graphic signal, a light source, a projection lens, and a color filter. In order to create an image, the DLP chip mounted with the mirrors is either tilted towards the light source (ON) or away from it (OFF). The rapid tilting creates a light or dark pixel on the surface. The system can come with a single-chip or three-chips. The single-chip system also includes a color wheel placed between a while lamp and the DLP chip. The color wheel is divided into sectors with primary colors, and now they also come with secondary colors. The rotating color wheel, along with the chip is used to project the image. A DLP system with three-chip eliminates the need for a color wheel, and also eliminates the problem of the “rainbow effect.” The rainbow effect is when a color streak is caused across the screen when a person looks away from the screen and then looks back swiftly. The three-chip DLP system splits the light from a lamp and routes the light to each primary color which is then routed to each of its individual chip, the colors are finally combined and then displayed through the lens. Three-chip projectors are most commonly used in movie theatres. The major differences between both the systems are DLP’s are thicker compared to LCDs and cannot be hung up on a wall due to their width. DLP’s consume less power compared to LCDs and have a higher refresh rate as well. One-chip DLP’s are prone to the rainbow effect, while LCDs are prone to a screen door effect. LCD’s also have a better viewing angle compared to DLPs. DLPs are cheaper and have a longer life span compared to LCDs.